In my life before Parkinsons I worked as a software trainer and a web developer. Neither required much creativity, and I didn't see myself as particularly artistic. 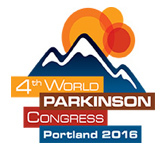 Everything changed, however, when I began taking a dopamine agonist as initial treatment for Parkinsons disease. My creative abilities flourished. I discovered I had a talent that I'd never been aware of before and I started using it to promote PD awareness. I was at my computer day and night creating cards, graphics, posters, etc. for use by national PD organizations. I had the honor of designing the Parkinson's Disease Foundation's annual holiday card. And it was in large part due to the graphics I'd created for PD awareness that I received the 2007 Murray Charters Award for outstanding service to the Parkinson's community from the Parkinson's Action Network. 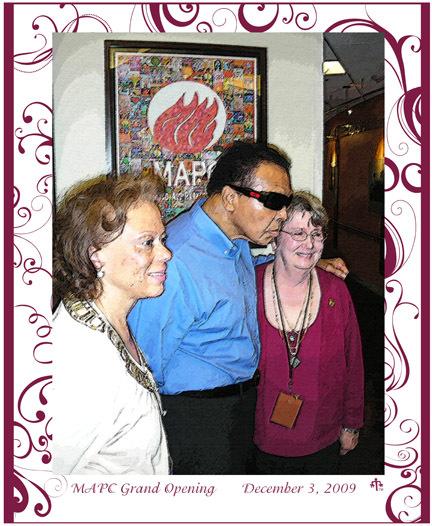 And in 2009, I worked on a group project for the new Muhammad Ali Parkinson Center to create a digital mosaic called "Let your energy light our flame" (at right). Art and creativity have become a big part of my life - an unexpected "gift" from PD. Who could have imagined that happening? "Let your energy light our flame" Digital mosaic hanging in the entry of the Muhammad Ali Parkinson Center, Phoenix, Arizona. As a member of a large team working on the project, Jean's part was to use her computer skills to lay out and incorporate digital copies of support group artwork into a single digital mosaic.